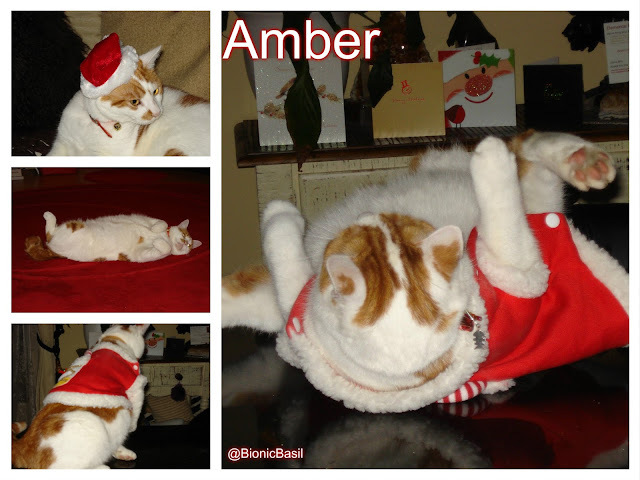 Hello fabulous furriends and welcome to my furst December post, mew may remember last year when I thought I'd wear my cute little red Kitty Claws outfit. Woo Hoo it's nearly Catmass!!! So the other day I thought I'd get my cutest little red Kitty's Claws outfit on and really get in the festive mood, what I didn't realise was, I've put a bit of weight on since I last wore it and it was just a smidge, let me repeat that, an eency weency smidge too tight. The other memfurs of The Heathen Hoard thought this was most funny, hilariously funny... I howeffur, did not. 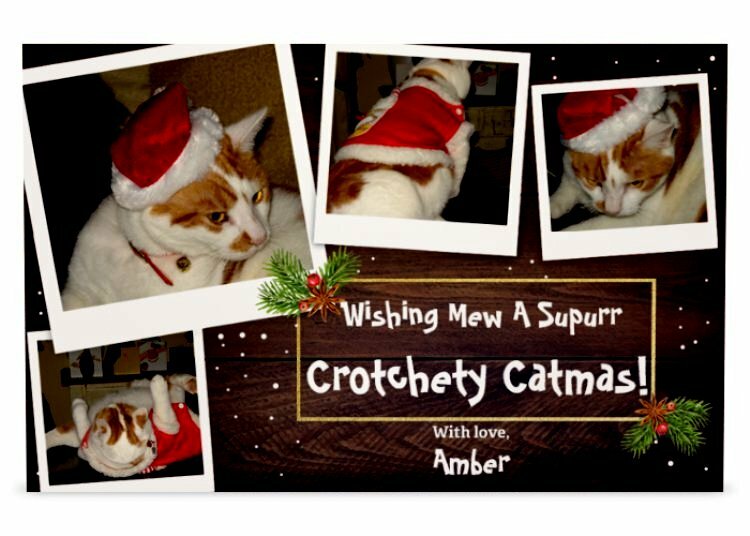 Mew may be wundering why I'm sharing this with mew, well mew know that I am now a proud memfur of The Crotchety Cougars Club, we did a Catmas Card exchange and I needed some really, really luffley beautiful cards to send out to my besties. So Smooch and Parsley appeared in the library office with young Fudge hot on their heals while I'm mulling offur my card dilemma. "What's up Amber?" Parsley asked. "Mew look like someones just put a book back in the wrong place!" I harrumphed loudly, as is customary when mew're as crotchety as me and replied. 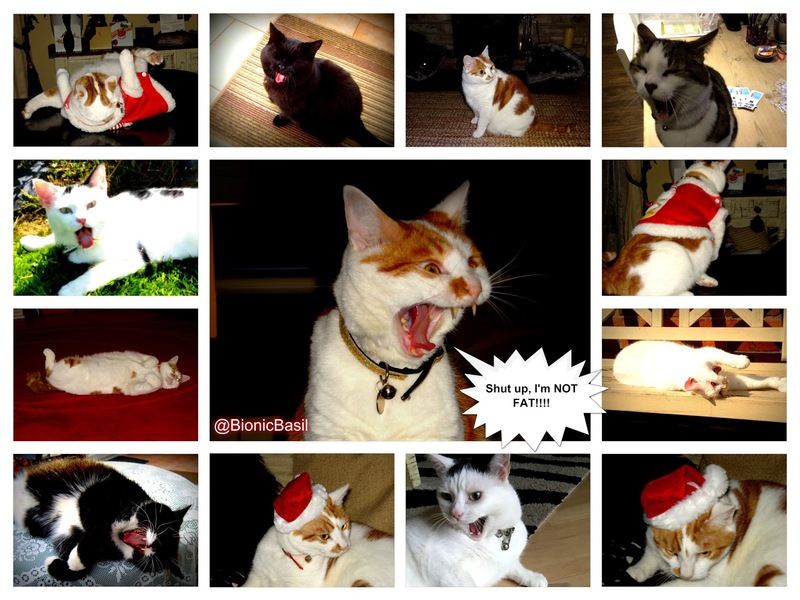 "I need a truly magnifique card to send to my sisfur-hood fur Catmas and I can't think of anything to send!" Smooch whispered in Fudges ear and Fudge began to snigger. "Amber we'd love to make mew a truly epically epic card, leave it with us!" Smooch beamed. "Really, mew'd do that fur me?" I asked happily. "It'd be our purrleasure!" Fudge added. "That would be pawesome, mew have until lunchtime," I grinned and curled up on my luffley library and started to snooze. "Amber we made your card and it's EPICALLY EPIC!" Smooch said trying not to laugh. I gave him a suspicious glance and then turned my attention to Parsley and Fudge who were borderline hysterics at this point. "What did mew do?" I asked through gritted teeth. 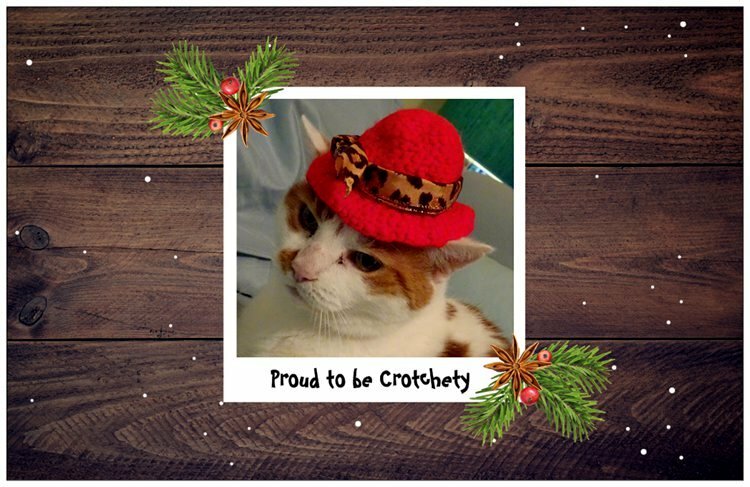 I was speechless, it was beautiful and purrfect and so freaking crotchety I couldn't believe my eyes! "It's just purrfect!" I managed to choke out as my emotions got the better of me. "Dudes mew did a truly epically epic design job and I can't thank mew enough!" The three heathens stared at me as though I'd just sprouted antlers with jingly bells on. "Mew like it?" 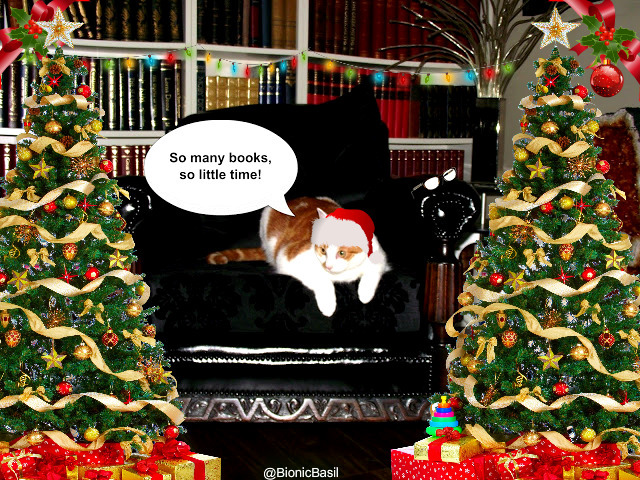 Smooch asked sobering up faster than mew could say, 'and a partridge in a pear tree!' "Like, mew really like it?" I nodded and beamed happily. "This is going to be the bestest Crotchety Catmas effur!" I whispered. The three heathens went into an emergency group huddle. "Dudes she likes it!" Smooch said in shock. "Yep we heard!" Parsley mewsed. "But she was supposed to throw a total fit!" Fudge said. "So we could film it and then it'd go viral on Cat-Tube!" "Dudes, we need better pics fur next year!" Parsley said. "Let's go back through the photo archives and see what we can come up with!" And now I think it's time we move on to this weeks book pick. 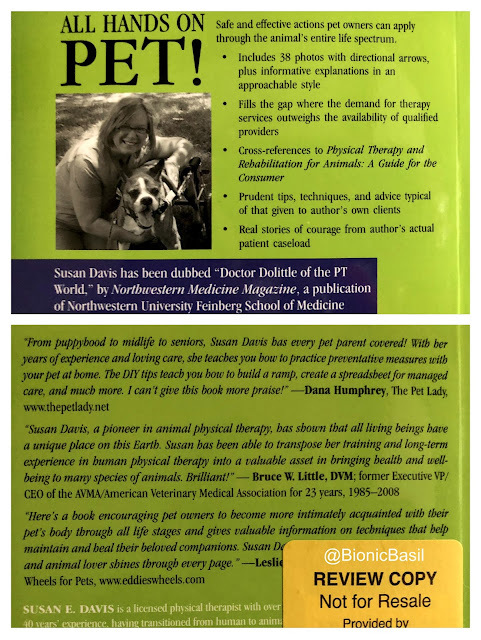 Susan E. Davis has been dubbed “Doctor Dolittle of the PT World,” by Northwestern Medicine Magazine, a publication of Northwestern University Feinberg School of Medicine. All Hands on Pet! 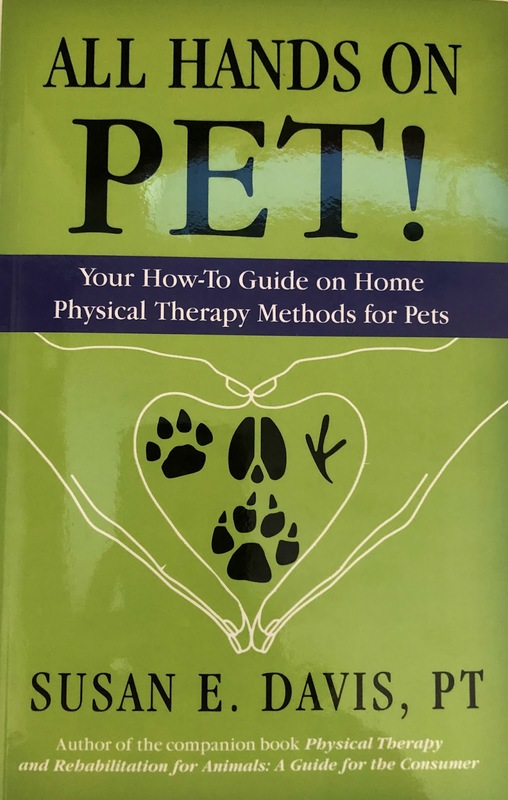 Your How-To Guide on Home Physical Therapy Methods for Pets offers safe and effective actions pet owners can apply through the animal’s entire life spectrum. Information provided applies to multiple species: canine, feline, avian, exotics and farm animals (non-equine). Includes 38 photos with directional arrows, plus informative explanations in an approachable style. Fills the gap where the demand for physical therapy services for pets outweighs the availability of qualified providers. Cross-references to Physical Therapy and Rehabilitation for Animals: A Guide for the Consumer. Real stories of courage from the author's actual patient caseload. All Hands on Pet! is a must-read for pet owners everywhere! Well some of mew may know that we are all fur alternative complimentary health purractices here at BionicBasil HQ, so it was fabulous to receive a copy of this book to review. I thought it was furry well written, though not the sort of book mew can read and do other things at the same like time like watch tv, mew need to focus to learn the techniques. There are lots of pictures which explain how to do and use the techniques, which is great as it's always better to watch somepurrdy demonstrate so mew can get your own technique down paw. It's not just fur cats either, it covers all anipal furriends, so whether mew're like Noah on his Ark or just a single kitty getting on with things, this book has info fur effuryone. 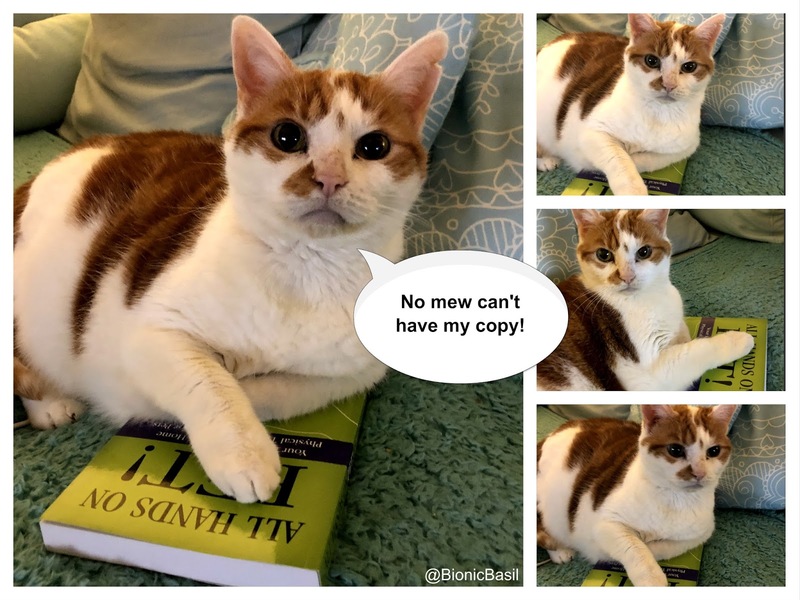 I really liked chapter 6 as that focused on Seniors, and as myself and Basil have now reached the dizzying heights of 15+, the author talks about a lot of different ways to assist us seniors in a variety of ways! All in all I would say this book would make a fabulous addition to the anipal health section in your library. *Disclaimer: I received a free copy of this book in exchange for my honest opinion. Now that was fun, Amber...ow Parsley nd Fudge's plans to ridicule you were thrown into chaos! MOL! Petcretary did that once when a young boy hoping to scare Petcretary shoved a pretty little brown snake at her...and she said to the young man: Wow, that is a 'little brown snake', can I hold it? (That is the name of that species); His jaw about fell off it opened so wide, MOL, MOL!!! Petcretary hopes he won't break a leg...when he is having a bad day she has to help him on the back steps to go outside...and then, whoot, he goes and runs through the yard like a cuckoo-head, MOL! Maybe a little off topic, but I don't think I've ever seen more purrfect cat pictures taken in my life. "Found to be Crotchety" and "Shut up, I'm not fat" - I would honestly frame these they are soooo good! hahaha. Looove the timing on those photos! That was a lovely Crotchety card. The joke certainly backfired on them. Amber, that's the best card and I hope you have the best Crotchety Catmas effur! Amber, those pictures are wonderful ! My personal favorite is the one of you on your back waving a hind paw...captures the joy and good spirits of the season ! Amber you are priceless in your lil' outfit & the card is so cute! Your fursibs did a great job putting it together for you! Hugs & tummy tickles! That's a great card, Amber. Did your Kitty Claws suit shrink? I know you're not fat. That looks like a good book to have on hand. That does sound like a great book, Amber. And Smooch, Parsley, and Fudge did a terrific job with your card!